The Funky Felter: I scored two sweet felting books at Half Price Books this weekend! I scored two sweet felting books at Half Price Books this weekend! My husband and I frequent the local Half Price Books store. If you aren't familiar with it, it is a chain of book stores with used books and some new books at half price or less. You can also trade in your old books, music, and movies for store credit or cash. We really like browsing there because you just never know what you might find. It is also neatly organized just like the larger, more expensive chain book stores. Half Price Books has a bit of a hodge podge of a selection though because it is primarily a used book store. I am always trolling the craft books section for anything felting, fiber art, spinning, dyeing, and textile related. It seems that most people want to keep that type of book because they are hard to find used. I must have gotten lucky this weekend though. I found not one, but two wonderful felting books! 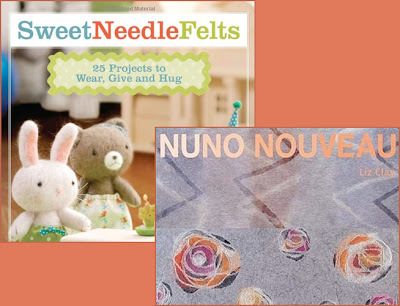 One is Nuno Nouveau by Liz Clay, and the other one is Sweet Needle Felts by Jenn Docherty. They are both well-written books with wonderful photos (and I am all about the photos when it comes to instructional books). I'm so glad to have a couple sweet new books to add to my ongoing fiber books collection. And, I scored both of them for just a little over $13. A great investment and a pretty amazing deal if you ask me. Congrats on the great finds! I hadn't considered going to a place like this for crafting books, but it's definitely something I'll have to look into. I'm all about getting a good deal! Good finds! Think about writing your own book...I know you'd have lots of buyers!!!!!!! Good reading! When's your book coming out?!!!! Elle, it is such a thrill when I happen upon a great used book at the book store or even a garage sale or thrift shop. Happy hunting! Connie, you are too kind! But I think that I need to practice and learn a bit more first. I'd also like my own public studio and fiber shop eventually. It is all on my very long to do list ;O) It is a very fun, fibery journey. My fav book store That is where I get all of my craft books.